“Going in Circles, Getting Whole” by David Burgdorf (a Forum participant) will set you in motion for the moving meditation that is the labyrinth. 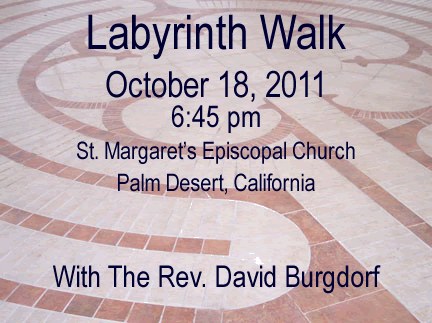 Every month the Labyrinth Guild at St. Margaret’s offers a time to experience the labyrinth within a group setting. I invite you to participate in this walk. Need additional inspiration about walking the labyrinth? I share the wisdom and experience of Macrina Wiederkehr a Benedictine Nun. Hip Deep in Tears opens her experience to you and will serve as an introduction to the power of the labyrinth. This is one tiny example of encounter with the power and mystery of God within the labyrinth. You will have your own story to tell. Come and walk. Previous Previous post: God is ready to spend. Are you ready?